opportunities being arisen because of China Pakistan Economic Corridor (CPEC) and other initiatives launched by the government. 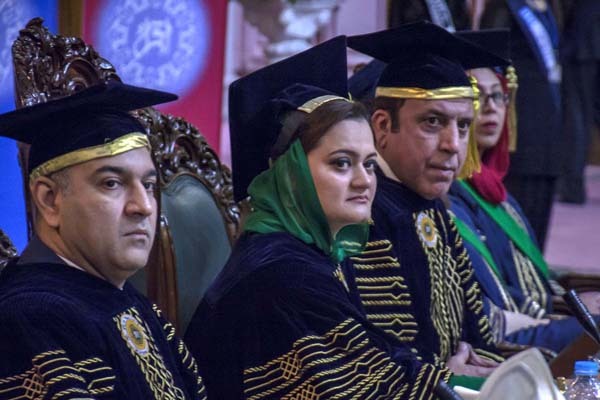 She was addressing the convocation of Iqra University held here to award degrees and medals to the successful students of various departments. “Realizing the fact that a huge chunk of the country’s population consists of youth, Prime Minister Nawaz Sharif has launched a number of schemes especially for them”, she added. The minister said the youth could also explore the PM Youth Loan Scheme, PM Health Insurance Scheme, PM Education Reforms, and a number of energy and infrastructure projects being launched under the CPEC. Moreover, the SDGs parliamentary task force secretariat, she added, also offered good opportunities for them. development related research and legislation,” she said. Paying tribute to the martyrs who sacrificed their lives on the borders to protect the country, the minister said due to their sacrifices, terrorism in the country had now subsided significantly. The country, she said, was fighting the war against terrorism as an imperative. The Pakistani nation was resilient and its resolve to eradicate terrorism and extremism was getting reinforced with each passing day, she added.